The chest press helps you increase pushing strength in various positions, whether you're lying on your back, sitting or standing. However, the chest muscles aren't the only ones that are working. Depending on the type of chest press exercise and the body's orientation, different muscles other than your chest fire in various degrees to stabilize your joints as you move. The type of chest press you do will depend on your goals and fitness ability. The pectoralis major is the broad muscle that covers your chest. It extends from the half of the collarbone that is closest to the center of your body, your sternum and the upper part of your six-pack muscle and inserts into a bony protuberance in the upper arm bone called the greater tubercle. All variations of the chest press work this muscle. When you retract your shoulder blades together, the pectoralis major is stretched. As your arms move closer to your center, the muscle shortens. Your pectoralis major couldn't do its job well without several assistants. Your triceps in the back of your arms extend as you push, while your trapezius and rhomboids protract and retract your shoulder blades. Beneath the pectoralis major is the pectoralis minor, which is a fan-shaped muscle that extends from the middle of your third and fifth ribs and inserts into a large, bony knob of the scapula near the shoulder joint that's called the coracoid process. It pulls the scapula down and toward your ribs. Even though you don't feel them working, stabilizers are working just as hard as the pectoralis major and its assistants. These muscles, which include the deltoids, rotator cuffs, erector spinae and transversus abdominis, tend to lie deeper toward your joints to maintain body stability and balance, especially when you perform the chest press in a standing position. 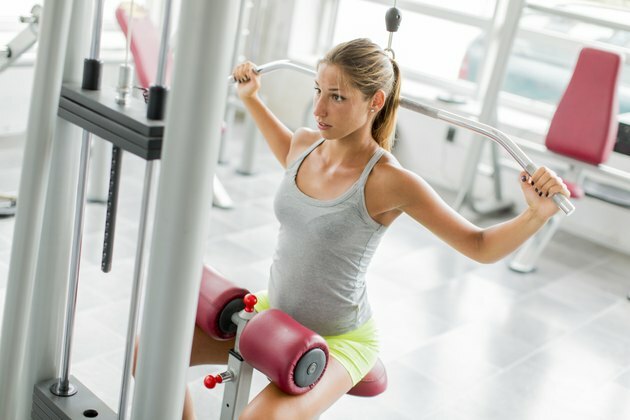 In a study performed at the Institute of Human Performance in Boca Raton, Florida, researchers found that standing chest press exercises elicit less chest muscle activation than the traditional bench press. They conclude that standing exercises require higher stabilizer muscle recruitment from the nervous system, which takes away some of the strength needed for the pectoralis major to activate more. Therefore, if you want to improve full-body stability, use the standing chest press. To enhance greater muscle growth, use the bench press. Your breathing muscles run on auto-pilot when you exercise. These include the diaphragm, intercostal muscles in your ribs and internal obliques. When you exhale, your diaphragm contracts and pushes upward against your lungs to push the air out, while the intercostal muscles contract your ribcage. As you inhale, your diaphragm pushes downward, allowing more air to flow into your expanded lungs. Exhale when you push during the chest press; inhale when you lower the weight.